The new Iranian defense minister, Brigadier General Amir Hatami, reemphasized immediately upon taking office on August 20, 2017 – and in honor of National Defense Industry Day – the Defense Ministry’s commitment to strongly support the Quds Force of the Iranian Revolutionary Guard Corps (IRGC), its commander Qasem Soleimani, and the “resistance front.” Hatami also stressed that he would promote the Iranian regime’s missile program – particularly ballistic and seaborne missiles – and would fight the American attempts to thwart the program and harm Iranian interests in the region. In the spirit of Supreme Leader Khamenei’s past remarks, the new commander of the Iranian army (Artesh), Major General Abd al-Rahim Mousavi, upon assuming office, vowed that he is “committed” to the goal that Israel would cease to exist within 25 years, thanks to the bravery of the Iranian Shahids (martyrs). Hatami, who has held senior positions in the conventional Iranian army (Artesh) and the Defense Ministry, is the first defense minister of the Islamic Republic who does not hail from the IRGC. He touched upon two of the main aspects of building Iran’s deterrent power, namely, the missile program and the export of the revolution (via the Quds Force). The Quds Force is still the spearhead of Iran’s efforts to restructure the Middle East in the wake of the Arab Spring. Its commander, Major General Qasem Soleimani, is almost personally involved in each combat arena where the force is openly engaged – in Iraq, Syria, and, via subversion, in Yemen and the Gulf states. In the second term of President Hassan Rouhani, Iran continues to pursue an ambitious agenda of entrenching its status as a regional power. Its influence – along with that of elements under its authority in Iraq and Syria – is growing. In those two countries, it seeks to establish facts on the ground with an eye to the day after they are freed from the grip of the Islamic State and to prevent negative developments such as the granting of independence to the Kurds. Iran is exploiting its contribution to the fight against the Islamic State in Iraq and Syria to entrench its status as a power broker, without which no new order will be established in either of those countries. Iran views Iraq and Syria not only as lines of defense for its own territory but also as part of its strategic regional vision of forging a Shiite territorial continuity from Iran to the Mediterranean Sea. This “Shiite crescent” is meant to include Iraq, Syria, and Lebanon to create a platform for the “resistance front” – a term for the ongoing struggle against Israel and the Sunni states led by Saudi Arabia. With this land corridor, Iran can transfer weapons to Hizbullah through Iraq and Syria, and Iran can turn Saudi Arabia’s long border with Iraq into a channel for transferring aid and weapons to subersive Shiite elements in the Saudi kingdom using the Quds Force and even move to destabilize Jordan. The active and ongoing involvement of the Quds Force in the main Middle Eastern arenas, particularly Syria and Iraq, enable it and its proxies to gain combat experience, to augment the continuing logistical assistance by air, land, and sea, and to test a wide variety of new battle tactics (on land and at sea). Such tactics will likely be used in future rounds of warfare with Israel, including from the “liberated” Syrian territory. In recent years, the Houthis have attempted maritime strikes on ships and ports of the Saudi-led coalition operating in Yemen. In August, the coalition forces managed to thwart several attempted Houthi attacks using waterborne improvised explosive devices (WBIED) near the port of Mokha on the Red Sea coast and remote-controlled waterborne explosive devices (RC WIED). Over the past year, the Saudi coalition forces were also able to thwart attacks by explosive suicide boats. In some cases, the Houthis have succeeded to hit the coalition forces. Iran and Hizbullah, which in recent years have been heavily involved in the Syrian arena and the struggle for Bashar Assad’s survival, will want to exact the “Syrian debt” and ensure that they remain in Syria after the war. This goal will probably dovetail with Russia’s interest in supporting the Iranian-led Shiite axis against the United States and the Sunni camp, including Washington’s efforts – so far unsuccessful – to get the Sunni camp involved in jumpstarting a comprehensive diplomatic process in the region to include the Palestinians. The new Iranian defense minister has taken office at a very sensitive time for Iran. From its standpoint, there is now a window of opportunity to exploit the Sunni Arab camp’s weakness and the Russian tailwind to advance its long-term interests in the region and fill the void left by the Islamic State. Again it comes as no surprise that in his initial statement after being elected and also during the hearing that was held for him in the Majlis (parliament), Hatami placed emphasis on the main components of Iran’s power – the missiles and the Quds Force – and on combating the United States, which Iran continues to regard as its arch-enemy. The defense minister also stressed Iran’s commitment to supporting the wider “resistance fronts” in Israel in particular, but also in the secondary Middle Eastern arenas – the Gulf States, Yemen, Saudi Arabia, Jordan, and the North African states, as well as those that oppose the United States in Latin America. As a military man rather than an IRGC man, Hatami is, in fact, likely to ramp up his commitment to the IRGC’s particular objectives – the missile and nuclear programs along with exporting the revolution. President Rouhani, too, in his address at the start of his second term, underlined Iran’s commitment to its long-range missile program despite the United States’ threats. On this subject, there is no controversy between the different camps in Iran. As in the North Korean case, the missile program and the nuclear program are clearly linked. The former, which Iran continues to promote openly, constitutes the platform for achieving Iran’s nuclear goals, which it keeps pursuing covertly. Iran is also threatening to openly resume the nuclear program if the United States keeps imposing sanctions. 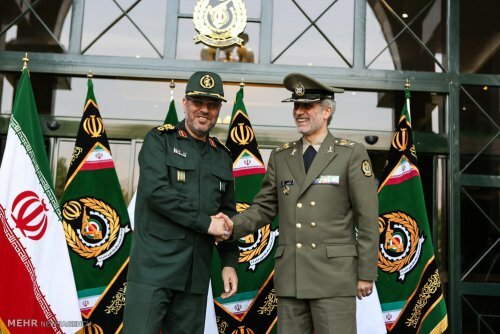 Iran’s Supreme Leader Khamenei appointed outgoing defense minister Brigadier General Hossein Dehghan as his senior advisor for military industries. Political, security, and intelligence figures who have played key roles in the Iranian government and the IRGC are serving as advisers in the Leader’s bureau. This office is a central body of a parallel government, more important than the Iranian government, in which Iranian policy in the field of security, foreign, and domestic policies are determined. Dehghan, in the Supreme Leader’s bureau, will continue to act to advance Iran’s interests with the extensive experience he has accumulated in his activities in the Revolutionary Guards. Dehghan filled a series of positions in Lebanon within the framework of the Revolutionary Guards, served as commander of the force, and was responsible, among other things, for building up the military power of Hizbullah. Dehghan was also involved in the attack (September 25, 1983) against the headquarters of the U.S. Marines in Lebanon in which 241 Marines and 58 French paratroopers were killed. In 2017, Dahghan declared, “Today, the primary and religious duty of all Muslims is to liberate Jerusalem and to put an end to the cancerous tumor of evil Zionism…The Palestinian cause is the common denominator of unity in the Islamic world.” It seems that the Dahghan will continue to be a major figure in shaping Iranian national security policy in the Supreme Leader’s bureau.